Photo to FlipBookis a Photo to flash page flipping albums conveter software that enables you to create stunning online photo albums from your photo collections. With Photo to FlipBook, you can create cool online photo albums less than 5 minutes, and you don't need any flash skills, only import your photos, and then choose the theme(look&feel) templates from a variety of pre-set of Photo to FlipBook, finally to build your realistic photo album with the real page turning effect. FlipBook Creator Professional is a PDF to flash flip book conveter software that enables publisher to turn static PDFs into eye catching Digital Flash Flipbooks with embed video, audio, flash and links. 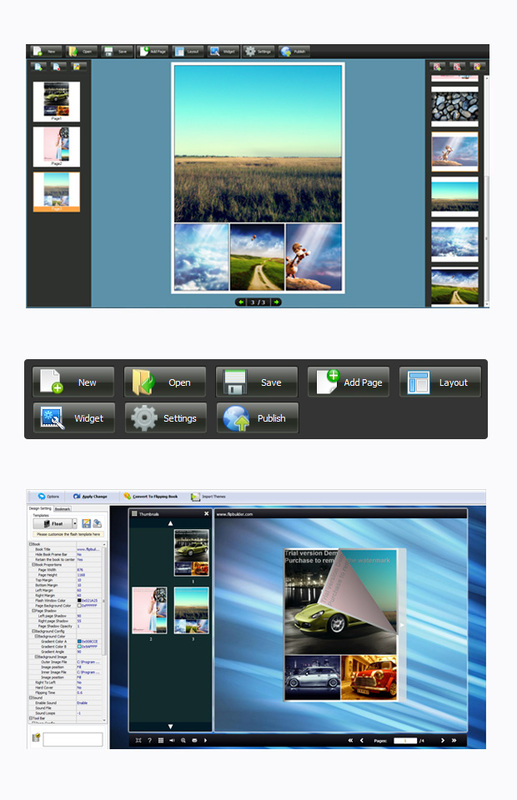 FlipBook Creator - Powerful PDF to FlipBook software to make online flash flip book with the real page turning effect. unlimited pdf to page-flip ebook conversion without paying royalties! PPT to FlashBook is your easy way to convert Microsoft Powerpoint Presentations into fashion and attractive flash eBooks with animations and sound! it can present two consecutive PPT slides side-by-side in animated flash eBooks. PDF to FlashBook is a lightning-fast electronic publishing software to help you convert ordinary PDF files into vivid flash catalogs with amazing 3D Page Sliding animations and sound! Flip PDF Professional allows you to build professional flash flip Books from PDF with the "page turning" effect for both online and offline use in minutes. Web Cartoon Maker is a free web tool for development of animated cartoons online. Web Cartoon Maker Player is required to play the compiled cartoons and convert them to AVI and other formats. SWF to FLA Converter for PC by Eltima Software is a new tool to convert any Macromedia Flash file into the original FLA. Thanks to it you can customize any file available on the Internet (providing that you don't abuse copyright notes) to suite your. Turn your still images into start-of-the-art animated transitions. Add 20 breathtaking special effect transitions to GIF Construction Set Pro 3 and PNG-MNG Construction Set 2. Turn unexciting still images into pulsating animations with this plugin. Web Cartoon Maker uses simple C++ scripts to produce high quality animated cartoons. Programming cartoons is very easy using characters, images and sounds from our online library (free clipart). GroBoto creates complex, dynamic, lyrical forms and animation with ease. It combines artistic expression with interactive exploration of an infinite universe of 3D form and motion. This site does not contain serial number, crack, keygen Photo to FlipBook serial number : serial number is the simplest type of crack. A serial number(cdkey,product key,etc) is register the program as you may already know. a crack or keygen may contain harmful software. If you cannot find the exact version you want, just give it a try. for more information read .nfo/.txt/.diz file include in zipped file.